Don’t wait until it’s too late – take action now. When you give power of attorney to someone you trust, they will be able to manage your affairs for you, should you become unable to do so. It’s never too soon to set one up – because you never know when you might need someone to help you in this way. When that time comes, things often happen very quickly. The person you choose as your power of attorney can be a relative, friend or someone in a professional capacity. It’s vital that it’s someone you trust. If you choose someone in a professional capacity, bear in mind that they will charge a fee each time they act on your behalf. If you’re receiving full time care and you believe you’re being wrongly forced to pay for that care, you will almost certainly need someone to help you challenge that decision and pursue NHS Continuing Healthcare funding to cover your care fees. If the person helping you has a Lasting Power of Attorney (LPA), it makes it much easier. It’s important to bear in mind that once you lack the mental capacity to make safe decisions for yourself, you can no longer set up an LPA. That’s why it’s vital to do it now. If you lose mental capacity and you haven’t appointed someone to be your power of attorney, one of your relatives or friends would then have to contact the Office of the Public Guardian. The Court of Protection would then go through a process of appointing a Deputy to manage your affairs. However, this takes time and can be expensive. The Deputy could be a member of your family or, if you don’t have any willing relatives, it could be a solicitor. In this case your savings would be used to pay for their services. It’s much better – and much kinder to your family – if you set up a LPA now, while you still can. Many people say that they’ll wait until they need one before setting one up. This is a BIG mistake. By the time you need one, it’s often too late. And even if a power of attorney can still be set up, your relatives’ hands will be tied – and they’ll be unable to protect your interests – until the power can be processed and registered (usually several months). In the meantime decisions are likely to be made for you by people you don’t know. Do it now. Having a power of attorney set up and ready to use makes no difference to your day-to-day life now. But once you have set one up, it can be used the moment you need it, with no delays. This is vital. You can also find out more from Gov.uk. For Scotland: Office of the Public Guardian (Scotland). Find out about making a Will. Read more about legal and financial matters in relation to care. These posts are really useful. My Mum is 74 years old. She had a major stroke in 2010. Her speech was impaired but she was still able to make some decisions and even sign at the time. But then suddenly she took a nose dive and she stopped speaking and unable to write. She has a Deprivation of Liberty Safeguard (DoLS) in place for which i am the RPR. She has been in only 2 nursing homes so far. I wanted to get LPA or POA but i understand that this would require my Mums actual signature? At the moment i offer guidance to medical professionals about Mums medical history, and am very involved from that perspective. I ask GPs just to run Mums new prescriptions past me because she has many allergies. But i haven’t had to make many drastic welfare decisions so to speak, but worked closely with authorities to help them to understand mum better because she is complex. Any experience or guidance from anyone would be most welcome. Hi SP. Unfortunately if someone has lost mental capacity it is no longer possible to obtain LPA. Instead it is necessary to apply to the Court of Protection for a Deputyship Order which has the same effect but the Court will appoint the nominated individual as guardian of the patient’s finances. If you would like to discuss this please do not hesitate to get in touch with us. I would like to know if a poet of attorney is in place does the attorney have any legal requirement to be informed or witness if and when a new will is written. I have LPA for my brother who has recently been admitted to a nursing home. I have expressed to the home that there are certain individuals that have caused my brother great distress in the past by their direct contact with him. I have requested that the home refuse access to these individuals – they tell me they cannot refuse access to anyone – unless my brother clearly states it to them even tho he has lost capacity. That sounds like a very distressing situation, Elaine – and it sounds as though the care home does not understand the nature of an LPA. You may perhaps have to get a solicitor to either intervene or write a letter under your instruction as LPA. Before you do that, it’s worth looking at the four questions that should be asked in any assessment of capacity. Remember that capacity is about a person’s ability to make a specific decision about a specific thing at a specific time – rather than a blanket view of a person’s general cognitive ability. 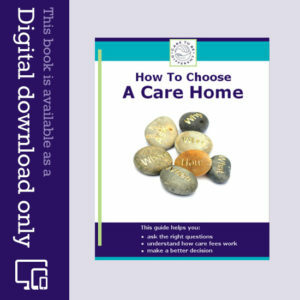 This article should help you: http://caretobedifferent.co.uk/mental-capacity-assessments/ Be sure to click the link to the ‘key questions a person should be asked’. Dear Elaine – I believe the Court of Protection has decided cases involving similar scenarios, whereby it Judged that decisions refusing other people access to the person who has lost capacity cannot be made by the Attorney under any Power of Attorney. There is a need for them here to strike a balance between that person’s Human Rights and the authority of the LPA document and I’m afraid this was not something which an Attorney had authority to decide. If you feel particularly strongly about it, I would suggest seeking legal advice with a view to making an application to the Court of Protection, if appropriate. My sister was born severely physically disabled and also with Learning Difficulties, she is now 47 years old. I have had a Property and Affairs Deputyship since 2007. It would seem that she would have never been able to make a Health and Welfare LPA due to her Mental Capacity and therefore the only way forward would be for myself to apply to The Court of Protection for the Health and Welfare Deputyship. I have read that they are not commonly granted and that the Court could make any decisions on my sisters behalf. I am forever being asked if I hold the Health and Welfare Deputyship by Social Workers and more so now that my sister’s care is funded by the NHS. Is there any chance that an application would be successful, before I waste £400, and should I use any particular wording? I feel that cases like this have slipped through the net. Wendy – you may need to speak to a solicitor about your particular situation and with specific regard to the wording you need to use. With regard to Continuing Healthcare, though, a financial power of attorney is fine for this, despite what some people in the care system may tell you. Dear Wendy – I have come across your enquiry above and thought I would offer you my experience of general health and welfare orders in the Court of Protection. I am a legal executive specialising in Court of Protection applications. You are quite right that the Court are generally reluctant to grant these sweeping orders as far as personal welfare and medical decisions are concerned. That said, your sister’s situation is slightly different since she has never been in the position to protect herself otherwise and, presumably, such matters have always been decided for her because she has never had the capacity to make these decisions (or at least some of them) for herself. Needless to say, the circumstances need to be exceptional and the evidence strong to support such an application. For example, if your sister has a lot of medical requirements or the need for regular hospital appointments, this is more likely to be granted than if this is not the case. There is no specific wording to be used which is more likely to get the matter through the Courts than not, it is more the strength of the evidence presented that such an Order is unavoidable. Care To Be Different has helped me to understand why I need a will and both lasting power of attorney. Can you please advise me what the general cost would be to put all this in place? I’m glad it’s helpful, Dorothy. Follow the Gov.uk link above. If you do the LPAs yourself, it costs £110 to register each one – unless you’re entitled to a reduction or exemption. If you use a solicitor it will cost more (and you would need to ask whichever solicitor you choose what they charge). Some people prefer to use a solicitor – but keep in mind that you don’t have to. You can do it yourself. Notify me of followup comments via email. You can also subscribe to this post without commenting. 2100 characters max. All comments are moderated in line with our Acceptable Use Policy and our Terms of Website Use. 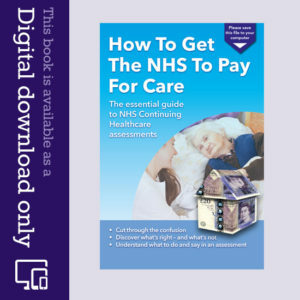 Many people find this e-book a cost-effective starting point: How To Get The NHS To Pay For Care. It takes you step-by-step through the whole NHS Continuing Healthcare process, right from the start, including how to approach the NHS, what should (and shouldn’t) happen, the pitfalls to avoid, what to do and say before, during and after an assessment, what’s right and what’s not, how to challenge decisions, how to pull apart the NHS’s assessment notes, etc. It gives you a firm understanding of the process and lots of useful and practical information.